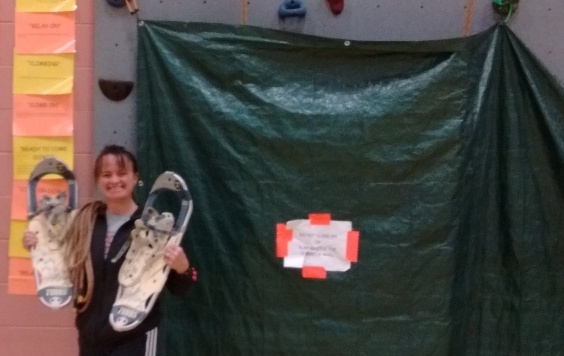 Wendy Wiesjahn, a physical education teacher at West Bend East High School, is in the process of creating a new class called Adventure Ed. 2. The class is on track to be introduced in the 2018-2019 school year, and will entail a strong presence of outdoor activities such as archery, trap shooting, outdoor survival skills and first aid, kayaking and snowshoeing. The course will also include more advanced rock climbing. Wiesjahn hopes to take the students to Devil’s Lake in Sauk County and other off campus sites. “We would actually plan a camping trip,” Wiesjahn said. That plan means Wiesjahn intends to offer the course only during second semester, for spring camping. However, she is hopeful to develop the program further in the future. “Eventually we might turn it into first and second semester, and do winter camping,” Wiesjahn said. One of Wiesjahn’s goals is to introduce more nature into the physical education curriculum. Wiesjahn is also confident that students will have a positive reaction towards the course. “I think they’ll love it, because they’ve been asking about it for awhile,” Wiesjahn said. Enthusiasm from the students is essential for Wiesjahn’s plans, for she has decided to raise the bar. In order to take Adventure Ed. 2, a student must first complete the Adventure Ed. 1 course with a C or higher. She believes plenty of students will have interest and qualify. Katie Kealiher, an East junior, feels that the new Adventure Ed. class is a great idea, based on her past experiences. “I took Adventure Ed. 1, and I had the time of my life,” Kealiher said. “I think it sounds better than any other gym class. She mentioned archery, and that’s pretty dang cool, too,” said Emily Frederick, an East sophomore also looking forward to the course. Despite the widespread anticipation for the course, it is still in the early implementation stages. According to Darci VanAdestine, Director of Teaching and Learning at WBHS, the right channels are Jeanne-marie Ciriacks, the district’s chief academic officer, or Jason Levash, the designee for review. After a course proposal is submitted, which is the first step of the process, they will give the course an initial endorsement three semesters prior to the year the course will be implemented. The next step takes place in the August of the year before implementation, where a final proposal is presented to the Curriculum Committee. Once the course has passed this phase, it will finally be developed and introduced into Build Your Own Curriculum, the district’s online curriculum portal.